We probably don’t have to convince you that Pinterest is amazing. It’s a playground of beautiful ideas. You can plan a wedding without leaving your couch! Not knowing what to make for dinner is a thing of the past! Need a new headboard? There are thousands of DIYs out there to get you started! It’s easy to get sucked in and then realize that you’ve spent all afternoon scrolling through those beautiful images. And you’re not the only one! Pinterest has over 150 million active users. 80% of those users are women and 87% of them have purchased a product because they saw it on Pinterest. From pretty pins to boards upon boards of ideas, it’s no wonder this visual search engine is one of the most popular social media sites! Having a killer Pinterest strategy can result in incredible traffic to your website and new customers. We are hesitant to call Pinterest just a social media platform because it’s so much more than that. It’s a visual search engine. And we all love search engines, right? Most of us are always quick to whip out our phones to ask Google whatever questions pop into our mind or conversations. Pinterest is no different. We even know some people who hop on Pinterest before they resort to Google! Each day, millions of users across the globe head to Pinterest to have their questions answered. They’re looking for fall decor ideas, new recipes, and new products every time they log in. They want to find creative, exciting, new ways to solve their problems. So when people are searching on Pinterest, they’re searching with purpose. With a strong strategy in place, you can be the business that answers their prayers. With Pinterest, it’s easy to find a whole slew of reviews at your fingertips. Since a large amount of bloggers are using this site, Pinterest users can find honest experiences and reviews from real people that have tested out your product. So when you’re creating your boards, think about the power of influencers! Pin reviews, testimonials, or blog posts featuring your business in action. Pinners are all about seeing new ways and ideas to put your products or services to use. TWEET THIS: "Pinterest has over 150 million active users. Are you using this platform to your advantage?" While it may not be social in the same ways that Facebook and Twitter are, Pinterest still is a social network. You get opportunities to connect each day with other pinners! By using group boards and the comment feature, you can find other businesses and blogs and start building those vital professional and customer connections. BONUS: Are you a blogger? You should be! Use Pinterest to your advantage. It can be a goldmine for boosting traffic to your website and products if you’re using it strategically! Make sure every post you write has a Pinterest-optimized graphic that will draw users in and make them want to click through to your site. We wrote a whole post dedicated to convincing you why you still need a blog if you want to learn more (and trust us… you do). Pinterest packs even more features than we’ve listed, but these three reasons are why a winning Pinterest strategy is a must for businesses and bloggers alike. So do we have you convinced? Are you ready to get a Pinterest strategy started and get your product or service in front of those 150 million users? She Can Coterie can make Pinterest work strategically and intentionally for you while you get back to doing the things that you want to do. First, get your Pinterest presence in shape with our free 15-point DIY Pinterest Audit. Like we said above, Pinterest is an amazing place to connect with you ideal customer and score some major conversions on your website. But this visual search engine requires a little bit of time and a whole lot of strategy to make sure your pins are reaching the right audience to boost your business! Enter your information below and we’ll send it straight to your inbox so you can get started. Second, you need to hire a Pinterest Manager. It will change your life. Our Pinterest Strategist will help you by scheduling pins for you, participating in group boards, uploading your content to Pinterest weekly, and so much more. She might even be doing it while you sleep! 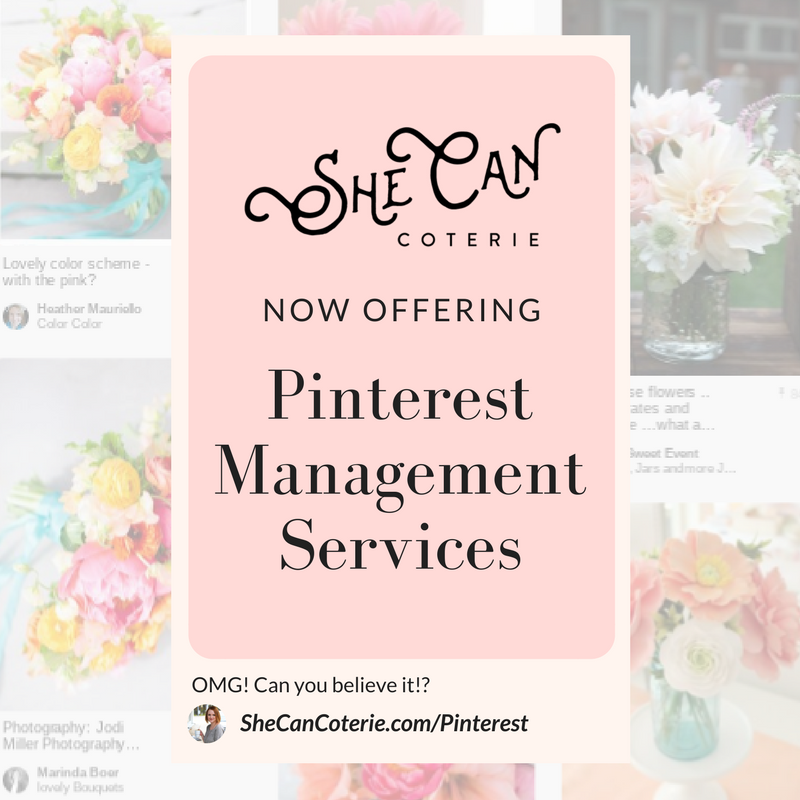 Want to know more about our Pinterest Management packages? Hop on a free Discovery Call with our Pinterest Strategist and learn how She Can Coterie can boost your business via Pinterest! Until next time… happy pinning, babes!